Pop star George Michael had a cocktail of drugs in his system when he was arrested in his car last year, a London court has heard. The singer, whose real name is George Panayitou, has admitted driving while unfit, but says his condition was due to "tiredness and prescribed drugs". The 43-year-old was arrested in October 2006 after motorists reported a driver slumped over the wheel of a Mercedes at traffic lights in north London. Sentencing has been put back to 8 June. Prosecutor Andrew Torrington told Brent Magistrates' Court in north London that tests showed a therapeutic quantity of an anti-depressant in the singer's system as well as the illegal dance club drug GHB. Cannabis was also found in his blood, but the prosecution do not maintain that this was the cause of his intoxication. 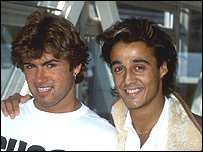 Michael (left) began his pop career as a member of Wham! The star's lawyer claimed a sleeping drug was the most likely explanation for his condition. He also told the court it was common for traces of GHB to be found in the blood even if the drug had not been taken. Prosecutors agreed that, while GHB is a banned class C drug, its effects could be created by other substances which are not controlled, including a drug called GBL. District Judge Katherine Marshall said the issue at stake was not the drug involved, but the condition Mr Michael was in when he was discovered in his car in October last year. The BBC's Ben Ando, who was at the hearing, said it was made clear that the star could expect to be sentenced at the "upper end of the scale for this offence". Mr Michael, who was not present, has already pleaded guilty to driving while unfit under the influence of drugs, which carries a maximum penalty of six months in jail. 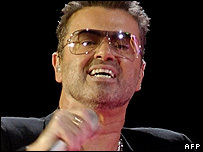 At a court appearance earlier this month, the former Wham! frontman addressed District Judge Katherine Marshall directly, saying: "I did something very stupid and I am very ashamed since doing it. "I'm not used to defending myself in a position where I am ashamed of something." He added: "I really have been very distressed by this whole thing. I am perfectly aware that I did something very wrong and got into my car when I was unfit to drive." Since his court appearance, Mr Michael has revealed he is addicted to prescription drugs and believes the world would be a better place if more people smoked marijuana. He will attend Brent Magistrates' Court to receive his sentence on 8 June, one day before he performs the first concert at the new Wembley stadium. "I have accepted throughout this affair that I was not in a fit state to have been driving a motor vehicle in the early hours of 1 October 2006 and accordingly pleaded guilty to the charge of driving whilst unfit through drink or drugs before Brent Magistrates' Court on 8 May 2007. "I am delighted that at today's hearing the court accepted that the proper approach to my case is that which I have always maintained, in that I was unfit through a combination of tiredness and prescribed drugs, and that I will be sentenced on this basis. "I would like to conclude by saying I am really looking forward to playing Wembley Stadium on 9 and 10 June."